Next to nothing is known about the Golden Novelty Company of Barnesville, Minnesota or its owners. Two references are found in The Billboard, a magazine self-described as the “World’s Foremost Amusement Weekly”. Then, in the May 3, 1947 issue, on page 26, under the heading of “Coin Machines”, there is an advertisement for Golden Novelty Co. of Barnesville, Minn. listing slots, consoles and cabinet safes for sale. Does this innocent candy dispenser link to a more colorful past? Research with the Historical and Cultural Society of Clay County indicates that the Golden family sometimes spelled their name Goulden, but in doing a search of digital business records from 1923 to 1948, nothing comes up. It had been mentioned by “old-timers” in the area that they were reputed to be involved in nefarious activity – including possible bootlegging during prohibition. But again, no records to back that up except that Roy’s brother, Frank is recorded to have been in and out of trouble with the law. A subsequent call to the Minnesota Historical Society and a search through their digitized records came up empty as well. They do have business records on microfilm that could possibly give a lead to follow – if the Golden Novelty Co. was registered with the state and registered under that name. Brother, can you spare a dime? Or how about a penny? 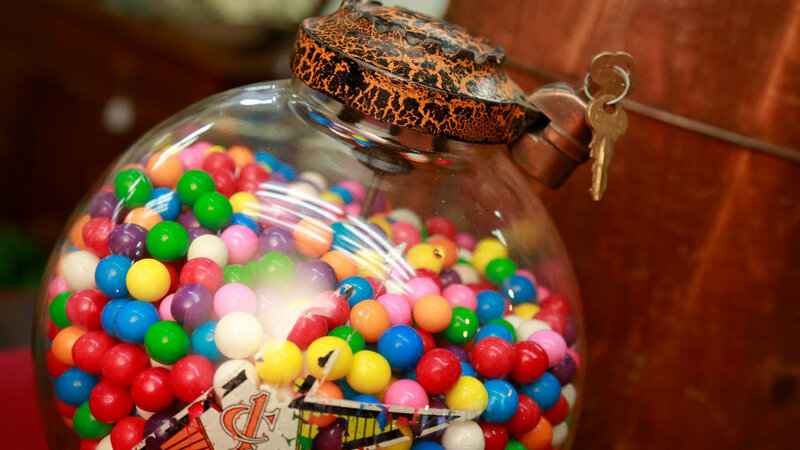 Over the years, how many of you have asked or been asked, “Can I have a penny for a gumball?” One penny in 1935 had the equivalent buying power of 18 cents in today’s world. For the collector of vending machines, this pristine, all original coin machine is the bees knees! That’s the low down on this extraordinary collectible. Stop in and fix your peepers on this gumball machine! While you are here, other out-of-the-ordinary antiques and collectibles may catch your eye as well! We have three levels of shopping space, where you can see many one-of-a-kind items that may be just what you need for your cave! We are Past and Present Home Gallery, the antique store with character!